Magento is an E-Commerce platform that provides tools to help online sellers run their businesses. FullStory can be set up on your Magento site by following the steps below. 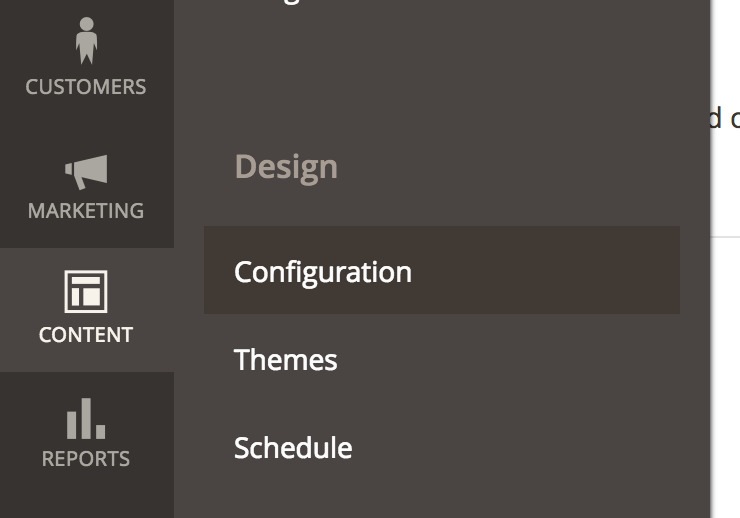 In the left sidebar, select Content > Design > Configuration. Click Edit for the View, Store, or Website to which you would like to add FullStory. If you want to enable recording for all content served by Magento, edit the global default configuration, shown first in the example below. In the selected configuration, scroll down to Other Settings > HTML Head. Expand HTML Head. At the bottom of the HTML Head section, find the Scripts and Style Sheets text box. Paste your FullStory recording snippet into the Scripts and Style Sheets text box (learn how to find the snippet here). Click the "Save Configuration" button in the upper right-hand corner. Tada! You can now ride into the sunset on your pegasus of customer experience insight! Note: Support for Magento 1 will continue through June 2020. In the panel on the left, select Design. In the "Miscellaneous Scripts" text box, paste your FullStory recording snippet (learn how to find it here). Click the "Save Config" button.